BSY Noni Capsules is comprised of pure extract of Hawaiian Noni leaves which have been introduced in India in collaboration with Hawaiian Herbals, USA. It is a HALAL and KOSHER certified product and produced under international GMP guidelines. Noni is helps for- B.P, joint pains, dietetics, heart attack, immune system, blood circulation, removes system deficiencies, increase stamina. Bsy noni hair magic shampoo minimum purchase 1box (24pice). Contact nine four four eight three one four zero nine three. 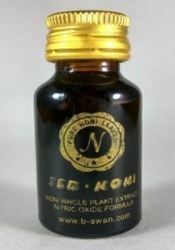 Noni capsule contains pure Noni fruit extract, Ocimum Tenuiflorum, Garcinia Indica, and Centella Asiatica with other very rare Hawaiian fruits extracts. This is better than many Noni products currently available in Indian market because of its unique feature of fighting against various diseases general health problems.